Sunday morning, Newcastle Quayside, Newcastle-on-Tyne. Although I’m not certain that the woman speaking to the crowd on this postcard is definitely a suffragette it does seem quite likely. The card itself is unused and there are no further clues as to the identity of the woman or the occasion that brought the crowds to the quayside area. 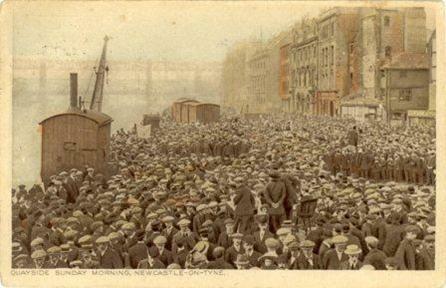 Below is a similar postcard, also titled ‘Sunday morning, Newcastle Quayside, Newcastle-on-Tyne’. 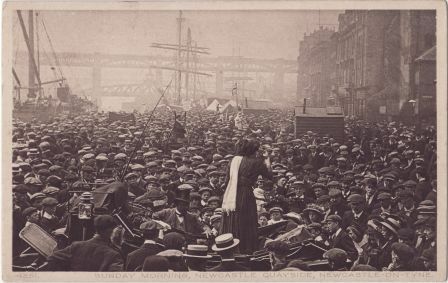 This one, mailed in 1915, unlike the one above does not have anyone speaking to the crowd but it does suggest that the large Sunday crowds were quite common. The publisher is listed as W.H. Smith & Son, Newcastle-on-Tyne. The only other text on the card reads ‘G 4351-346’.